The baby wipe background in the first card was made by swiping the baby wipe across the paper. This gives a broad coverage and creates a striped background. The second background was created by gathering up the baby wipe and bouncing it on the card stock to create a stipple type of look. Although I didn't know it when I made these cards, I actually used a number of retiring items on them. Wisteria Wonder, Elegant Eggplant and Wild Wasabi are three of the colours from our main colour collection that are being retired. 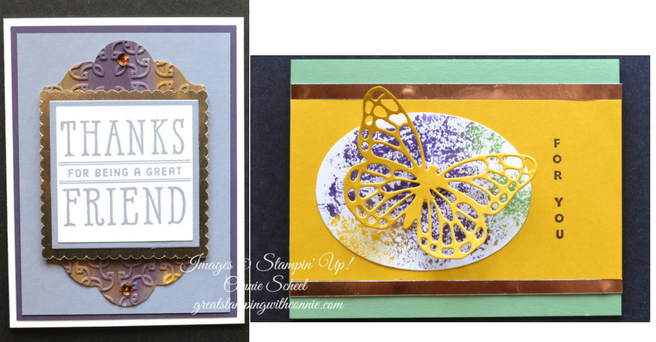 In addition to these colours, the Window Shopping stamp set (Thanks for being a great friend), the Lots of Labels Framelits and Butterflies Thinlits are also retiring. If any of these items were on your wish list, make sure you order them right away while they are still available. Just head over to my online store where you will find all retiring products, as well as great products that will still be available in the new catalogue. Use the April Host code - SV47CD49 on your order if it is less than $200 and receive a special thank you gift from me. If your order is over $200, do not use this code, you will want to collect the host rewards yourself, and I will still send you the thank you gift.